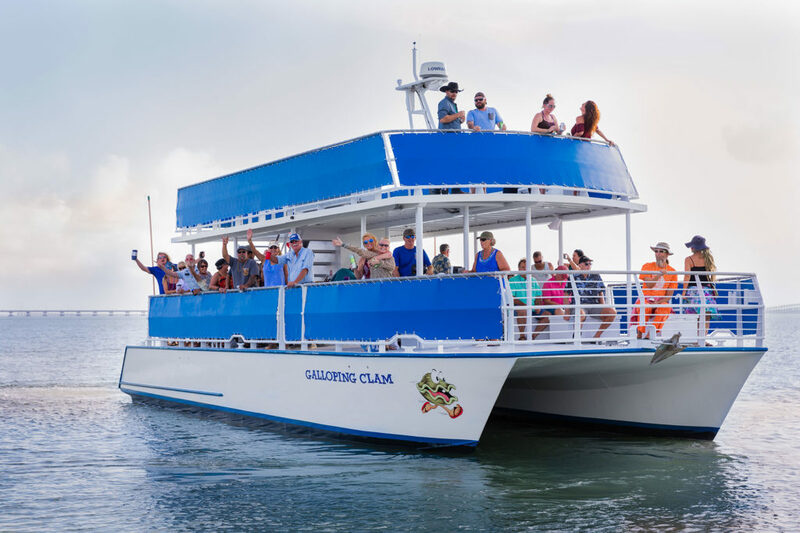 The Galloping Clam is designed for Private Charter including corporate events, birthdays (boy, do we love birthdays), reunions, family outings, wedding dinners and receptions (the captain gets to kiss the bride unless it’s that other kind of wedding when he’ll pass) etc. We’ll customize every trip for your occasion so long as it’s fun. If you can dream it up, we can make it happen. No funerals, please. Irish wakes ok.
Boat names carry great meaning and superstition. To be a successful boat, it must carry a worthy name and be properly christened before being put to sea. 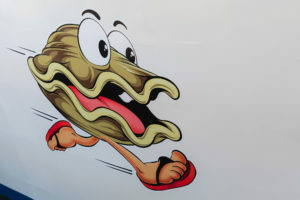 The Galloping Clam carries quite a storied family history. In 1939, the first namesake was set to sail in Connecticut races on Long Island Sound with one small distinction. The boat’s first name given by the owner was the “White Swan.” However, photos show that the wooden hull was stubby in shape and porpoised in its movement at speed under sail. 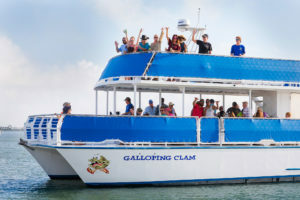 The captain despised the name and in his genius called it “Galloping Clam” which was not only humorous, but pretty accurately described its appearance and movement during races. Race days were Saturdays with registration using a large numbered chalk blackboard. 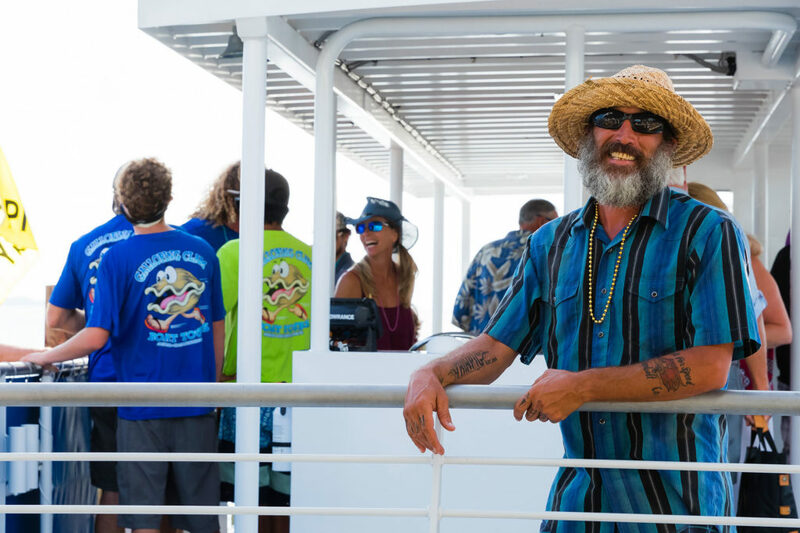 The captain would enter the Galloping Clam while the owner, not far behind, erased the name and entered the “White Swan.” The captain of course would respond with the “better name.” And so, a playful feud began. 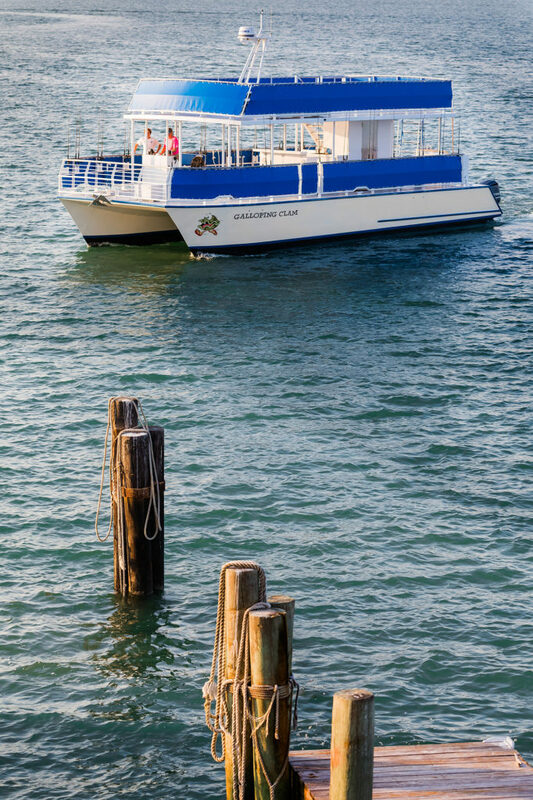 But now, the name has a boat! 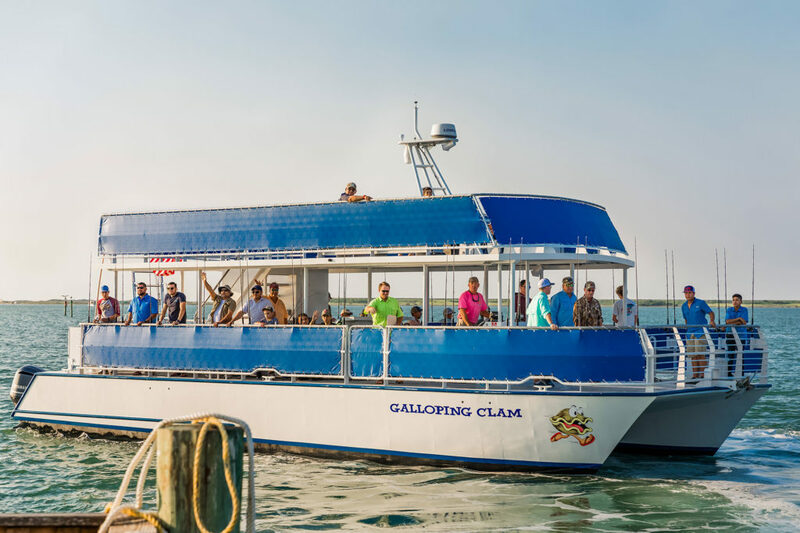 We welcome the Galloping Clam to Jim’s Pier. This license shall automatically terminate if you violate any of these restrictions and may be terminated by Jims Pier at any time. Upon terminating your viewing of these materials or upon the termination of this license, you must destroy any downloaded materials in your possession whether in electronic or printed format. The materials on Jims Pier's web site are provided "as is". Jims Pier makes no warranties, expressed or implied, and hereby disclaims and negates all other warranties, including without limitation, implied warranties or conditions of merchantability, fitness for a particular purpose, or non-infringement of intellectual property or other violation of rights. Further, Jims Pier does not warrant or make any representations concerning the accuracy, likely results, or reliability of the use of the materials on its Internet web site or otherwise relating to such materials or on any sites linked to this site. In no event shall Jims Pier or its suppliers be liable for any damages (including, without limitation, damages for loss of data or profit, or due to business interruption,) arising out of the use or inability to use the materials on Jims Pier's Internet site, even if Jims Pier or a Jims Pier authorized representative has been notified orally or in writing of the possibility of such damage. Because some jurisdictions do not allow limitations on implied warranties, or limitations of liability for consequential or incidental damages, these limitations may not apply to you. The materials appearing on Jims Pier's web site could include technical, typographical, or photographic errors. Jims Pier does not warrant that any of the materials on its web site are accurate, complete, or current. Jims Pier may make changes to the materials contained on its web site at any time without notice. Jims Pier does not, however, make any commitment to update the materials. Jims Pier has not reviewed all of the sites linked to its Internet web site and is not responsible for the contents of any such linked site. The inclusion of any link does not imply endorsement by Jims Pier of the site. Use of any such linked web site is at the user's own risk. 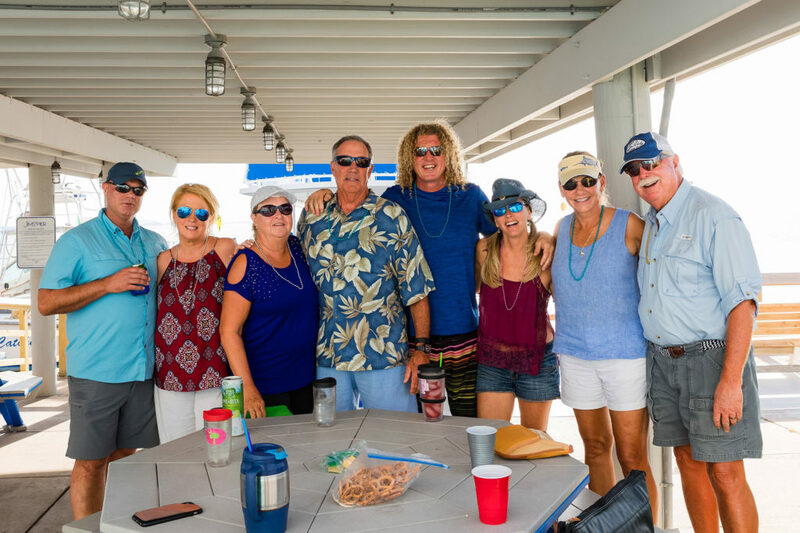 Any claim relating to Jims Pier's web site shall be governed by the laws of the State of Texas without regard to its conflict of law provisions.